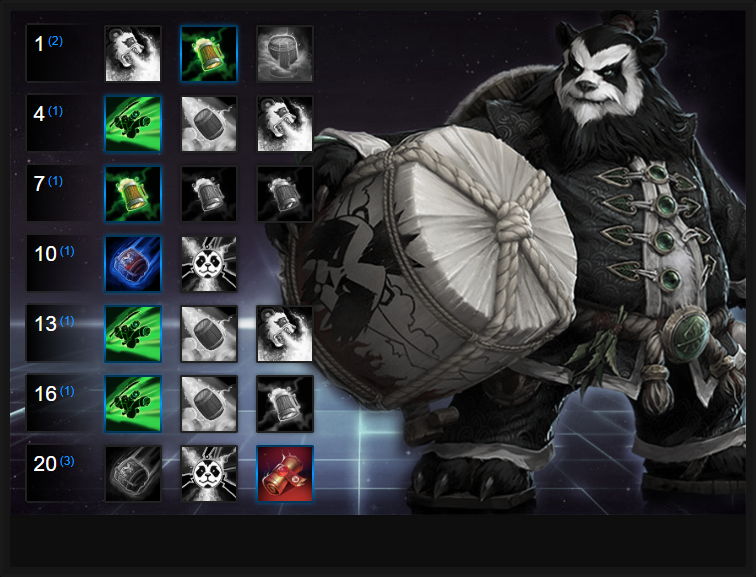 In this Chen Build Guide, we provide an overview of his strengths, abilities, talents and matchups. Chen is one of my favourite Heroes and in the right hands, is incredibly powerful. With practice he can be a formidable Warrior and I'd argue he's equal to Muradin in terms of survivability and mobility. His shielding, allowing him to withstand so much punishment, mean he not only deals damage over a long period, but can successfully body block the opposition. Chen is particularly strong if played alongside another Warrior, especially if it's an offensive partner such as Sonya/Tyrael/Leoric because he can act as a damage sponge and shield provider, whilst they provide continued pressure. Just be conscious of the fact that he's easily interrupted, ensuring if he's drafted early, he can be hard-countered. Fortifying Brew (Trait) - Chen's Trait is a large part of what makes him such a unique Hero. Being able to use your abilities, drink from your keg to gain a large shield, then use your abilities again gives Chen a fantastic laning phase. If you’re able to channel uninterrupted, it also means you can soak up a lot of damage in a team fight. The shield returned is enormous as long as he isn't interrupted and if he isn't, he can sustain himself for a long time against two targets. Flying Kick (Q) - You’ll be using Flying Kick to either catch someone out, or initiate a team fight. You can choose to grab Pressure Point at level 13 to apply a massive slow, or can simply opt for the mobility and utility the ability provides naturally. On the latest patch, the accuracy was increased, allowing it to hit enemies much more consistently. What's particularly strong about Flying Kick however is the fact that it places Chen on the opposite side of the enemy you hit, allowing to to body block them easily. Chen relies massively on Flying Kick and for his team to follow in once he's by the enemy. Effective use of the ability is key to locking down high value targets. Keg Smash (W) - is a short ranged AoE ability that deals a small amount of damage. The most important part is the slow, which can be quite beneficial, and the fact that it soaks everything hit with Brew. Combined with Breath of Fire, this can quickly clear minion waves, or put down some meaningful damage on multiple enemies in a team fight. It's best used after immediately after Flying Kick followed by Breath of Fire. Breath of Fire (E) - On its own, Breath of Fire doesn’t deal a lot of damage. However, any enemies soaked in Brew from Keg Smash will take the damage again, over 3 seconds. This can help clear minion waves, or apply a DoT effect on several enemies during a team fight. Due to all of Chen’s abilities having the same cooldown, you’ll be looking to Flying Kick in, Keg Smash on your opponents, then immediately Breath of Fire them to get the most damage possible. Try to always maintain this ability on the enemy. Wandering Keg (R) - Until level 10, Chen’s only form of crowd control is the slow from Keg Smash. That’s not necessarily ideal for a Warrior, but he can to make up for that once Wandering Keg is unlocked. It’s useful for isolating a priority target, zoning out the other team’s back line during a team fight, or to even interrupt/steal merc camps (or bosses, if your timing is excellent.) You can use this to your advantage on any map with a boss. Be aware however that you can still take damage as a Wandering Keg and against a coordinated team, this can see you killed very quickly. Storm, Earth, Fire (R) - If you’re willing to sacrifice the crowd control, Chen’s other Heroic (Storm, Earth, Fire) could be appealing to you. You’ll want to use this right before a team fight starts, or when the enemy has used their stuns, so that it isn’t interrupted. Once it’s in effect, you’ll essentially have 3 mini-Chens. This can be useful, as the other team can either ignore you and constantly take damage, or take out your 3 spirits. Storm, Earth, Fire also provides you with a good amount of survivability and mobility. What I will say about this Ultimate is that it's value is is primarily for providing Chen with mobility outside of his Flying Kick - it's amazing for escaping. Just be aware that if all three of your spirits die, so will you. On small Battlegrounds and if you're pursuing a sustain build, take Freshest Ingredients. Combined with your shielding, it offers high amounts of amounts of health return and when the quest is complete, you'll retain 50% of your shielding when you've grabbed 30 Regeneration Globes. The only caveat to this talent is the fact that gaining 30 health orbs on large maps can be challenging, and will see you need to lane for at least 10 minutes. Chen relies massively on Flying Kick so having it cost no Brew ensures you can always engage. What's also good about Deadly Strike is the fact that its damage is increased by 100% if you have shielding. Used immediately aftering drinking your Brew, it offers fantastic spike damage. Brewmaster's Balance takes practice to maximise it's use (you can gain both buffs at 50% Brew) but is worth it if you're lacking support from your team. The talent provides two benefits, depending on your Brew amount (+20% movement speed and +40 health per second). However, you need to maintain 50% Brew to have both active at once. The easiest way to achieve this is to maximize your Brew, before completing a single rotation of your abilities. This brings you to the 50% sweet-spot where you can gain the benefits of both. Variable: Chen is incredibly vulnerable to stuns, so taking Purifying Balance allows him to mitigate some of this threat. When stunned or silenced, and if drinking, Fortifying Brew's cooldown is reset and the crowd control against you has its duration reduced by 75%. In addition to this, Fortifying Brew also grants 30% Spell Armor while your shield is active. For isolating a Hero and pushing them away, or back to your team, Wandering Keg still has the highest winrates for Chen. It makes him Unstoppable, and ensures he can make life hell for Support Heroes. Variable: Storm, Earth, Fire is the go-to Heoric if you're under heavy amounts of crowd control, simply because it provides so much utility and survivability. You can use it to escape, engage and still deal some damage in the process. Unlike Wandering Keg it doesn't bring crowd control but does make Chen incredibly difficult to kill. Pressure Point is amazing in team fights to snare an opponent by 35% for 1 second. Although its duration is brief, if your opponent is already soaked in Brew (from Keg Smash) they'll then be snared by 70%. Ideally and to maximize this talent, you want to use your Brew before using Flying Kick. Flying Leap increases the range of Chen's Flying Kick by 15%. It doesn't sound a lot, but when you need to dive the back-line it prevents most players from escaping. Stormstout Secret Recipie allows Chen to heal himself for 1.5% of his maximum health for every ability he lands against a Hero. When rotating his abilities in amongst the enemy team, combined with his earlier Talents, that's a lot of sustain. Variable: If you took Storm, Earth, Fire, grab Elemental Conduit. Not only do your spirits gain 100% of your maximum health, but their abilities are also empowered. Storm grants spirits Unstoppable, Earth has its cooldown reduced by 3 seconds while Fire grants continuous attack speed. You can comfortably 1 on 1 any Hero with this. This list of tips and tricks are just a handful of things we think will help your Chen. We'll continue to add to the list as required and if you have any tips you'd like to share, let us know in the comments below and we'll place them here. 1. Always drink your Brew to the maximum - constantly. 2. Your Flying Kick is a brilliant escape tool if you target a wall or an enemy minion. Make use of it to survive. 3. Your damage combination should always be Keg Smash > Breath of Fire > Flying Kick. Alternatively, engage with Flying Kick followed by Keg/Breath. 4. Both of Chen's Heroic abilities are excellent for escaping; just be sure to use them before you die or get too low. 5. Remember that your Fortifying Brew grants an instant shield at level 7. You don't have to constantly sit and drink. 6. The shield you gain from Fortifying Brew is also amazing at allowing you to tank bosses. It's more than possible for you and one other to quietly steal a boss. 7. Chen is naturally good at body blocking thanks to his large body. Using it in close quarter areas as it's invaluable at protecting your team. 8. Always try to use Flying Kick on high value targets. If you can pressure a Support Hero, you'll force them out of a fight. 9. Your Storm, Earth, Fire can be interrupted. Make sure you use it in plenty of time before your health gets too low. 10. Chen relies on his team following in once he's used Flying Kick. If they don't, he's left massively exposed. 11. Your shielding can typically keep you alive for a long time versus one Hero. Against two or more however and you'll have to stop drinking and move.